A slow metabolism may indeed be linked to obesity in some cases, a new study finds. "Slow metabolism" as an explanation for obesity has been largely knocked down by doctors as inaccurate. But University of Cambridge researchers showed in a new study that mutations on a particular gene slow metabolism, which may be linked to obesity in some people. Previous research had shown that mice without the gene KSR2 tended to become overweight. In this study, researchers sequenced the DNA of 2,101 people with severe early-onset obesity and 1,536 people who were not obese. They saw that mutations in KSR2 were associated with "hyperphagia (increased appetite) in childhood, low heart rate, reduced basal metabolic rate and severe insulin resistance." 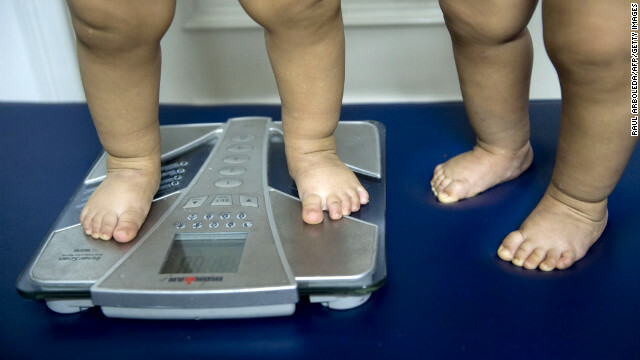 Fewer than one in 100 people have KSR2 mutations, and some of those do have normal weight, BBC News reports. This genetics research could have implications for developing drugs that help people with obesity and type 2 diabetes, the study said. Past studies have suggested that diabetes raises the risk for Alzheimer's disease although it's not entirely clear why. New research finds that even in people who don't have diabetes, chronically higher blood glucose levels are associated with poorer outcomes in the brain. This study looked at 141 people, average age 63, without diabetes or pre-diabetes. No participants were overweight or had memory and thinking impairment. On cognitive tests, participants with lower blood glucose levels performed better in terms of delayed recall, learning ability and memory consolidation than those with higher levels. What's more, those with higher levels tended to have smaller volumes in the hippocampus, a sea horse-shaped brain structure crucial for memory. This study received significant media attention, but Dr. Jane Chiang, the American Diabetes Association's Senior vice president of medical affairs and community information, said she has a lot of concerns about the way it was conducted. The participants weren't entirely "healthy," according to their blood glucose levels - in fact, they may have diabetes and not know it, she said. A bigger concern, Chiang said, is that older adults aren't recommended to have a strictly regulated "normal" blood glucose in the first place. Low blood sugar presents dangerous risks of falls and seizures, so the American Diabetes Association discourages tight blood sugar control in older adults. You may go into a restaurant thinking you'll eat a salad, but some burger-loving friends may lead you astray. New research shows who you eat with affects your food choices. This study took place at an Oklahoma restaurant over three months. In one part of the restaurant, guests received menus with items and prices. A second restaurant section got menus that included calorie counts. A third section received menus with this information in addition to traffic light symbols indicating lower (400 and lower), medium (401-800) and higher calories (800 plus). University of Illinois food economist Brenna Ellison found that people dining in groups tended to choose items from the same menu categories as the others in the group. “The big takeaway from this research is that people were happier if they were making similar choices to those sitting around them,” Ellison said in a statement. “If my peers are ordering higher-calorie items or spending more money, then I am also happier, or at least less unhappy, if I order higher-calorie foods and spend more money." Many studies have looked at the health effects of coffee, a touchy subject since it's part of the routine of so many Americans. Scientists have a hard time determining how much influence coffee has over your health since so many lifestyle factors contribute to positive and negative outcomes. The latest study to pile onto this line of research brings good tidings: Coffee consumption reduces the likelihood of liver cancer - specifically, the common form called hepatocellular carcinoma - by 40%. According to this analysis, three cups of coffee is even better, reducing odds by 50%. These insights are based on a meta-analysis of 16 high-quality studies from 1996 to 2012, which makes the evidence a lot stronger than from just one experiment. But before you rejoice and drink up, remember: This study did not prove that coffee causes any benefits at all. In fact, people with liver cancer may reduce their coffee intake, which could also explain the association. In other words, you can prevent liver cancer with a lot more certainty by getting vaccinated for hepatitis B, controlling hepatitis C transmission and reducing alcohol consumption. The ability to juggle several chores or duties at once is important in many occupations. A new study finds that women may be better at performing two tasks at once than men, but cautions that this is only one piece of research and shouldn't be used to make generalizations. Researchers gave 120 women and 120 men a computer task-switching test, and separately gave 47 women and 47 men a handwritten task-switching exercise involving more "real life" scenarios. In the first experiment, men were slower at performing tasks that were quickly interchanged than women. In the second, the study found that "men and women did not differ significantly at solving simple arithmetic problems, searching for restaurants on a map, or answering general knowledge questions on the phone, but women were significantly better at devising strategies for locating a lost key." Again, this is a small sliver of all men and women, so don't take this study to mean that any given man is inferior than a woman at finding misplaced keys. Saturday is National Prescription Drug Take-Back Day. The initiative is targeted at preventing increased pill abuse and theft. From 10 a.m. to 2 p.m., you can drop off expired or unneeded medications at a designated location near you. These fine 'studies' I did not miss but did ignore. Another 'study' I did not miss, also ignored, was the one that discovered school girl pregnancies resulted from their addiction to motherhood. Since when is a burger considered unhealthy and by who? bi mmmmmmmmeeeeeeeeee!! eet mor chikin!!! OBAMA NICOLAS MADURO SANTO SPAIN KING HARPER CANADA.